In this chapter explanation will be given as to how you can grant access to your channel so you can share your video’s with other users. 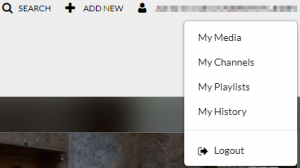 Click on ‘My Channels’ in the user-menu. Click on the pen-icon on the bottom right side of the channel thumbnail for the channel you wish to share with other users. Wait for the edit-page to load. Click on the ‘Members’ tab. Wait for the channel members page to load. 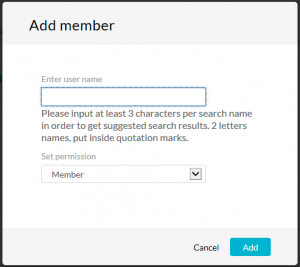 Click on the blue ‘Add Member’ button on the right hand side of the page. Enter the ULCN-name (last name preferred) for the person you wish to grant access to your channel. 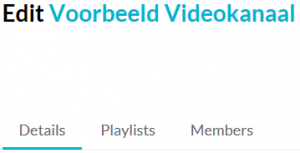 | NB: The user must have logged into the videoportal at least once for them to appear in the system. Underneath the input field a suggestion based on your input will appear. Click on the name of the person you wish to add. Click on the ‘Add’ button to add the new user. If successful a green information-bar will appear (‘[username] was added to your channel’). The person you added will now be able to see your channel on his/her ‘Channels’-page. This page can be accessed through the navigation-bar.